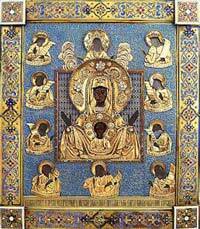 The Wonderworking Kursk Icon of the Mother of God "Of the Sign"
The Kursk Root icon of the Mother of God "Of the Sign." 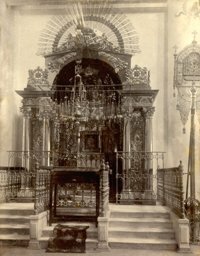 The reliquary of the Kursk Root Icon in the Cathedral of the Sign, Kursk, before the revolution. This icon is coming to visit my church this month. 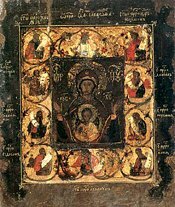 I am a member of St.Stephens a OCA Church in Philadelphia,I like to read about the history of the Kursk Root Icon,I am looking forward to seeing it in person and venerating it.